Most of the folks who have commented on my blogs regarding screening have been pretty outspoken about their belief that screening should continue and that the US Preventive Services Task Force was wrong in recommending against screening. In support groups, as I have discussed, men seem to feel that either their lives were saved by screening or that had they been screened earlier they would have been cured. Both points of view may be true for a minority of individuals, but the individual experience does not reflect doing good for the whole population. 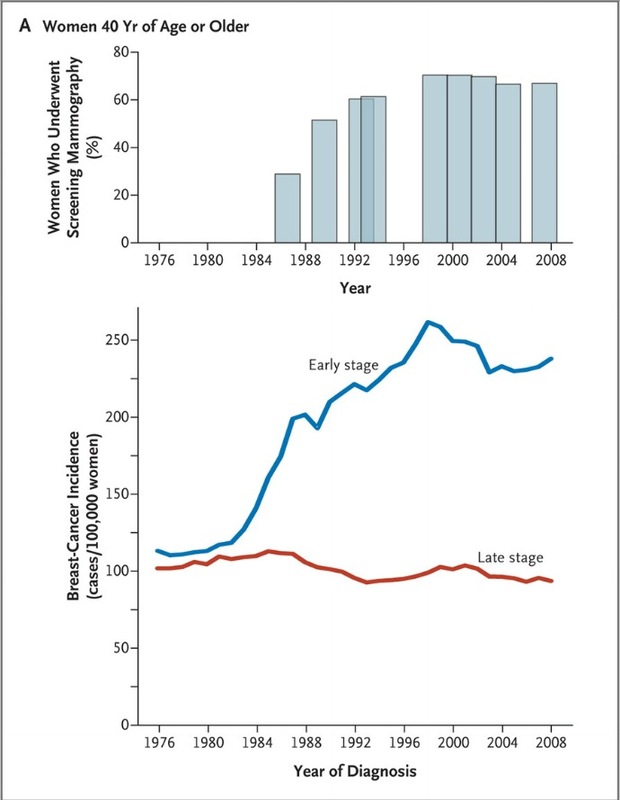 The figure shows little change in the rate of late stage cancer, even though there is a huge increase in the number of early cases detected. If anything, the prostate cancer statistics are considerably better, and the prostate screening advocates argue that the real benefits won’t be seen for many more years. The number of cases of advanced prostate cancer has gone down since PSA screening was introduced, but without as much effect on prostate cancer deaths thus far. Of course if taking your prostate out had no side effects, we could all agree that removing everyone’s prostate after someone decided on no further reproduction could be a safe and reasonable procedure for all men – maybe like vasectomy. But, both breast cancer treatment and prostate cancer treatment clearly DO have side effects. So the answer isn’t so easy in my mind. I will mostly be interested in what the advocates do about this article, and I wonder when it isn’t so personal, whether men will have any different views of this cancer dilemma than of the prostate screening challenge. Nicely stated. You do a great job condensing the literature into understandable terms. I saw the great cancer article picked up by a lot of media but so far little reaction. I don’t think the PC community will ever change since THEIR DOCTORS believe that they are saving lives and never admit the damage done. I could not even engage my doctors in discussions about sexual dysfunction. They always answered a question and then changed subjects. I suspect that your readers are somewhat select in that most of us have had or have prostate cancer. We would not be a diverse group to objectively comment on evidence based medical studies as we are “anecdotal” in the worst way. Common sense can and does fly in the face of statistics on occasion. Early diagnosis and treatment would still seem to be the cornerstone of most medical problems. If this is believed to be true, the problem is that the screens are as yet not exact enough, the treatments are not the correct approach as yet, or that the number of people studied have not been sufficient. I suspect that better screening and better treatment in the future will be change our approaches. Informed screening and informed treatment and the problems with each still makes sense to a retired physician. The problem is making sure that a physician can and will keep up and objectively present evidence based information as it becomes available and assist patients in their decision making process. I appreciate that you did just that for me. An interesting point was made in the discussion of the nejm article. It pointed out that screening becomes less and less useful as treatment improves. As they said, no one would screen for pneumonia since the treatment is so effective. Hopefully that’s where we are headed. The media love a conflict and have succeeded in framing the problem that way: to screen or not to screen. This is a disservice to patients because the best answer is neither. Rather it is to focus on providing the clearest, most accurate information possible, say on the website you mentioned earlier, urging patients to consult it, and encouraging them to choose for themselves. Each man is different: there is no single right answer. We should focus on giving him the tools to make the right individual choice. It has been said that men do not pay attention, or cannot understand, implying that someone needs to make the decision for them. Similar thinking was prevalent in the middle ages! The research is extremely useful, and you do us a great service by making it accessible. The artificial controversy is like arguing about whether we should all drink red wine or all drink white wine. It distracts the medical profession from providing what all patients really need: easily digested, high-quality information to help them make their own, individual decisions. I suspect for many of us that the issue is not whether we accept the data but whether more information is better than less. It probably is true that many men may suffer the side effects of treatment that in some sense was not necessary. But this really says nothing about the PSA test per se but as Dr. Fogle noted says we need better tests and corresponding clinical responses. In the mean time, I still want the information. Your comment on how the efficacy of treatments may make the issue moot in a sense says that we can move away from ‘surveillance’ and to a clinical indicator and to hopefully less impact on our lives. You did not comment on what that clinical indicator might be? Not PSA? As an aside PSA did not catch my cancer, a DRE did. If there is ultimately an indicator it will likely be a panel of gene expression levels. It would not ever be black and white, but one could hope for example that a profile could tell you it is “95% safe to leave this Gleason 7 cancer untreated” but “it is important to treat this Gleason 6 cancer aggressively since it has a >60% chance of spreading in 5 years.